The AppLocker configuration service provider is used to specify which applications are allowed or disallowed. There is no user interface shown for apps that are blocked. When you create a list of allowed apps, all inbox apps are also blocked, and you must include them in your list of allowed apps. Don't forget to add the inbox apps for Phone, Messaging, Settings, Start, Email and accounts, Work and school, and other apps that you need. In Windows 10 Mobile, when you create a list of allowed apps, the settings app that rely on splash apps are blocked. To unblock these apps, you must include them in your list of allowed apps. Delete/unenrollment is not properly supported unless Grouping values are unique across enrollments. If multiple enrollments use the same Grouping value, then unenrollment will not work as expected since there are duplicate URIs that get deleted by the resource manager. To prevent this problem, the Grouping value should include some randomness. The best practice is to use a randomly generated GUID. However, there is no requirement on the exact value of the node. The following diagram shows the AppLocker configuration service provider in tree format. ./Vendor/MSFT/AppLocker Defines the root node for the AppLocker configuration service provider. ApplicationLaunchRestrictions Defines restrictions for applications. Find publisher and product name of apps - step-by-step guide for getting the publisher and product names for various Windows apps. Whitelist example - example for Windows 10 Mobile that denies all apps except the ones listed. EnterpriseDataProtection Captures the list of apps that are allowed to handle enterprise data. Should be used in conjunction with the settings in ./Device/Vendor/MSFT/EnterpriseDataProtection in EnterpriseDataProtection CSP. In Windows 10, version 1607 the Windows Information Protection has a concept for allowed and exempt applications. Allowed applications can access enterprise data and the data handled by those applications are protected with encryption. Exempt applications can also access enterprise data, but the data handled by those applications are not protected. This is because some critical enterprise applications may have compatibility problems with encrypted data. Recommended deny list for Windows Information Protection - example for Windows 10, version 1607 that denies known unenlightened Microsoft apps from accessing enterprise data as an allowed app. This ensures an administrator does not accidentally make these apps Windows Information Protection allowed, and avoid known compatibility issues related to automatic file encryption with these applications. Each of the previously listed nodes contains a Grouping node. Grouping nodes are dynamic nodes, and there may be any number of them for a given enrollment (or a given context). The actual identifiers are selected by the management endpoint, whose job it is to determine what their purpose is, and to not conflict with other identifiers that they define. Different enrollments and contexts may use the same Authority identifier, even if many such identifiers are active at the same time. Defines restrictions for launching executable applications. Defines restrictions for executing Windows Installer files. Defines restrictions for running scripts. Defines restrictions for running apps from the Microsoft Store. Defines restrictions for processing DLL files. This node is only supported on the desktop. Supported operations are Get, Add, Delete, and Replace. Policy nodes define the policy for launching executables, Windows Installer files, scripts, store apps, and DLL files. The contents of a given Policy node is precisely the XML format for a RuleCollection node in the corresponding AppLocker XML policy. Policy nodes are a Base64-encoded blob of the binary policy representation. The binary policy may be signed or unsigned. For CodeIntegrity/Policy, you can use the certutil -encode command line tool to encode the data to base-64. If you are using hybrid MDM management with System Center Configuration Manager or using Intune, ensure that you are using Base64 as the Data type when using Custom OMA-URI functionality to apply the Code Integrity policy. Data type is string. Supported operations are Get, Add, Delete, and Replace. The EnforcementMode node for Windows Information Protection (formerly known as Enterprise Data Protection) does not affect the behavior of EnterpriseDataProtection. The EDPEnforcementLevel from Policy CSP should be used to enable and disable Windows Information Protection (formerly known as Enterprise Data Protection). The data type is a string. Supported operations are Get, Add, Delete, and Replace. The data type is a string. Supported operations are Add, Delete, Get, and Replace. You can pair a Windows Phone (Windows 10 Mobile, version 1511) to your desktop using the Device Portal on the phone to get the various types of information, including publisher name and product name of apps installed on the phone. This procedure describes pairing your phone to your desktop using WiFi. If this procedure does not work for you, try the other methods for pairing described in Device Portal for Mobile. On your Windows Phone, go to Settings. Choose Update & security. Then choose For developers. Turn on Device Portal and keep AuthenticationOn. Under the Device Portal, under Connect using: WiFi, copy the URL to your desktop browser to connect using WiFi. If you get a certificate error, continue to the web page. If you get an error about not reaching the web page, then you should try the other methods for pairing described in Device Portal for Mobile. On your phone under Device discovery, tap Pair. You will get a code (case sensitive). On the browser on the Set up access page, enter the code (case sensitive) into the text box and click Submit. The Device Portal page opens on your browser. 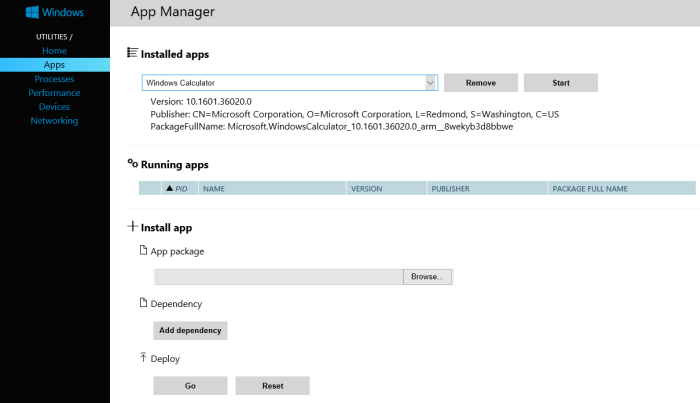 On the desktop Device Portal page, click Apps to open the App Manager. On the App Manager page under Running apps, you will see the Publisher and PackageFullName of apps. If you do not see the app that you want, look under Installed apps. Using the drop down menu, click on the application and you get the Version, Publisher, and PackageFullName displayed. The following table show the mapping of information to the AppLocker publisher rule field. The product name is first part of the PackageFullName followed by the version number. In the Windows Camera example, the ProductName is Microsoft.WindowsCamera. This can be used either in the HighSection or LowSection of the BinaryVersionRange. HighSection defines the highest version number and LowSection defines the lowest version number that should be trusted. You can use a wildcard for both versions to make a version independent rule. Using a wildcard for one of the values will provide higher than or lower than a specific version semantics. You can get the publisher name and product name of apps using a web API. Go to the Microsoft Store for Business website, and find your app. For example, Microsoft OneNote. Copy the ID value from the app URL. For example, Microsoft OneNote's ID URL is https:<\span>//www.microsoft.com/store/apps/onenote/9wzdncrfhvjl, and you'd copy the ID value, 9wzdncrfhvjl. "publisherCertificateName": "CN=Microsoft Corporation, O=Microsoft Corporation, L=Redmond, S=Washington, C=US"
This value will only be present if there is a XAP package associated with the app in the Store. If this value is populated then the simple thing to do to cover both the AppX and XAP package would be to create two rules for the app. One rule for AppX using the packageIdentityName and publisherCertificateName value and anothe one using the windowsPhoneLegacyId value. When you create a list of allowed apps in Windows 10 Mobile, you must also include the subset of Settings apps that rely on splash apps in your list of allowed apps. These apps are blocked unless they are explicitly added to the list of allowed apps. The following table shows the subset of Settings apps that rely on splash apps . The product name is first part of the PackageFullName followed by the version number. The following list shows the apps that may be included in the inbox. Note This list identifies system apps that ship as part of Windows that you can add to your AppLocker policy to ensure proper functioning of the operating system. If you decide to block some of these apps, we recommend a thorough testing before deploying to your production environment. Failure to do so may result in unexpected failures and can significantly degrade the user experience. PublisherName="CN=Microsoft Corporation, O=Microsoft Corporation, L=Redmond, S=Washington, C=US"
The following example disables the calendar application. The following example blocks the usage of the map application. The following example disables the Mixed Reality Portal. In the example, the Id can be any generated GUID and the Name can be any name you choose. Note that BinaryName="*" allows you to block any app executable in the Mixed Reality Portal package. Binary/VersionRange, as shown in the example, will block all versions of the Mixed Reality Portal app. most of the inbox apps, but not all. In this example, MobileGroup0 is the node name. We recommend using a GUID for this node. The following example for Windows 10 Holographic for Business denies all apps and allows the minimum set of inbox apps to enable to enable a working device, as well as Settings. <FilePublisherCondition PublisherName="CN=Microsoft Windows, O=Microsoft Corporation, L=Redmond, S=Washington, C=US"
Name="Whitelist Device Portal PIN UX"
The following example for Windows 10, version 1607 denies known unenlightened Microsoft apps from accessing enterprise data as an allowed app. (An administrator might still use an exempt rule, instead.) This ensures an administrator does not accidentally make these apps Windows Information Protection allowed, and avoid known compatibility issues related to automatic file encryption with these applications. In this example, Contoso is the node name. We recommend using a GUID for this node.